UNI Mobile Print is a service provided by Information Technology that lets students, faculty, and staff submit print jobs from their computers on-campus, personal or University-owned, to any Print Release Station printer across campus. 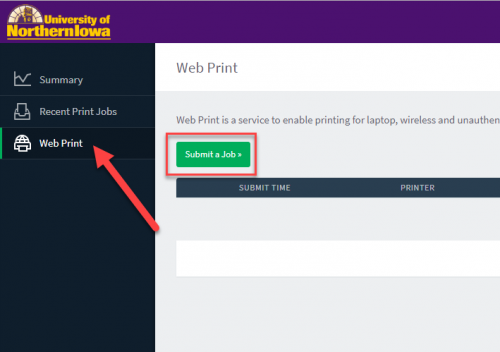 To accomplish this, users submit their print jobs via the Mobile Print web portal, select a printer, and then release the print job upon arriving at that printer's physical location on campus. 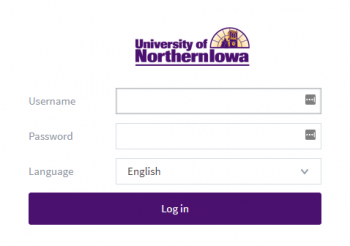 If you are unfamiliar with the Mobile Print web portal, please see the support article entitled Introduction to UNI Mobile Print. To get started printing, visit the Mobile Print web portal at mobileprint.uni.edu and sign in with your CatID credentials. Once logged in, click on the Web Print tab on the left-hand side navigation menu. This will bring you to the web print submission page. Click on Submit a Job. The next screen asks you to enter the number of copies you want to print. Current Information Technology policy states you can only print one copy to any computer lab printer at a time, so entering anything over 1 will cause your print job to fail. Once you have made sure 1 is entered, click 3. 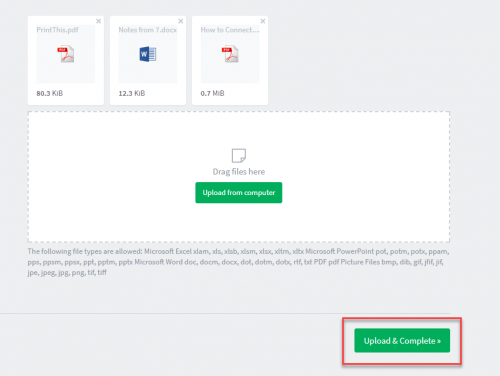 Upload Documents >>. The next screen will ask you to select the document on your computer that you would like to upload and print. A table on the page outlines the acceptable file formats. Click on Upload from computer. Then browse your computer for your desired file. Once you have found the document you would like to upload, select it and then press Open. You will see the documents you uploaded, once this is complete, click on Upload & Complete. You will see a screen showing you a summary of the print jobs submitted. The status will say Queued in position as Mobile Print uploads your file to the server. The status will change to Rendering job and then finally to Held in a queue. Once you have reached this point, your print job is awaiting you at any Print Release Station located around campus. That's it! You're done! Your print job is now being held by the print server. To release it, visit a Panther Print Station on campus and follow the instructions posted.